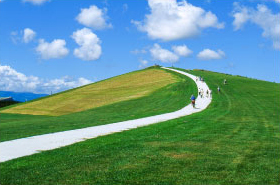 Moerenuma Park is a comprehensive park in Sapporo that is intended to be the base of the “Circular Greenbelt Concept” that combines the green spaces of the city of Sapporo within a loop. Construction commenced in 1982, and the park had its grand opening in 2005. Sculptor Isamu Noguchi created the basic design based on the concept of “the whole being a single sculpture.” The fountain and hills form many geometric shapes in the expansive grounds, facilities for play equipment and so forth are arranged in an orderly manner, and the landscape can be enjoyed as a fusion of nature and art. Cherry blossoms bloom in the spring, and the fountain and wading pool facilities are open to make for a refreshing Sapporo summer. Fall brings foliage, and you may enjoy cross-country skiing and sledding across the snow-covered landscape during winter. The park has attractions for all seasons. 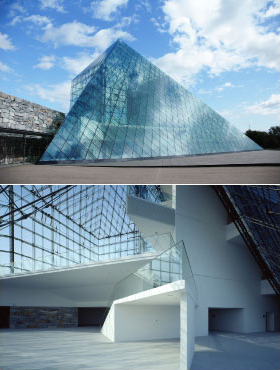 In addition, the park was converted from a waste treatment plant, and an air-conditioning system was installed in the Glass Pyramid, an indoor facility, that uses the natural, region-specific energy of snow. It is also an attraction from a nature conservation perspective. 1977 Commencement of Land acquisition of the waste disposal site with the aim of turning it into a park. 1982 Commencement of construction on the park foundations. Establishment of “basic plan for (former) Sapporo Green” The “Circular Greenbelt Concept” is raised. 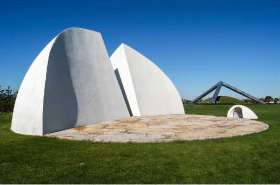 1988 July, Involvement of Isamu NOGUCHI in the Moerenuma Park construction plan.November, Completion of New Master plan.December, Death of Isamu NOGUCHI at age 84. 1989 Beginning of construction according to Isamu NOGUCHI? s master plan. 1998 Soft opening of Moerenuma Park. 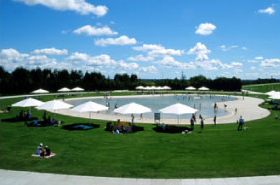 2005 Grand opening of Moerenuma Park. 90-min. flight from Tokyo to New Chitose Airport. 36-min. train ride and 70-min. bus ride from New Chitose Airport to JR Sapporo Station. “Rapid Airport Express” departs from New Chitose Airport for JR Sapporo Station every 15- min. and takes 36-min. Fares: Adults 1,070 yen / Children 530 yen. The seasonal bus service to Moerenuma Park in the summer runs to all parts of the city, including “Bus Center”, “Chikatetsu Asabu eki(Bus Termnal)”, and others. *The west entrance (Nishiguchi) will be closed during snowfall. Serving as the symbol of Moerenuma Park, Glass Pyramid is the central facility of this park that is considered to be one complete sculpture. Filled with sunlight, the atrium overlooks the park and creates an expansive space for rest and relaxation that is integrated with nature. This facility accommodates a gallery introducing sculptor Isamu Noguchi with visuals and books, a multi-purpose space that serves as a place for citizens cultural activities, restaurants, shops, etc. It is a place of exchanges, recreation and relaxation for many visitor, irrespective of the weather or the season. Apr.29 – May 9:00-19:00 First Monday on each month. *Tuesday, if Mon. is national holiday. During the creation of the park’s basic plan, Isamu Noguchi revealed, “I have been studying fountains all my life”, and thus sketched a large 48-meter fountain in the center of the park. 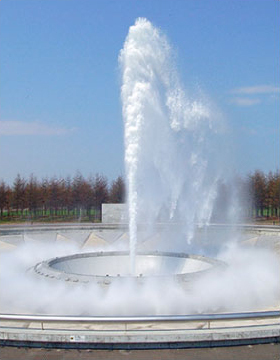 Created in reference to a similar fountain in Miami’s Bayfront Park which closely resembles Noguchi’s vision, the Sea Fountain can also be called “a sculpture of water”. At its maximum height the fountain can reach 25 meters. The dynamic momentum and flow of water portrays the birth of life and the heavens above, giving the entire park a feeling of life. *The fountain is lit up at night. *Service may stop or time of service may be reduced in the event of inclement weather such as strong winds or heavy rain. This is a green zone that includes seven Play Equipment Areas, A through G, which are interconnected by paths. 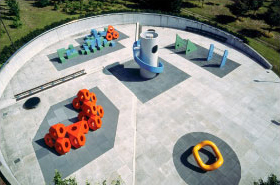 All of the play equipment pieces were designed by Isamu Noguchi and are beautiful enough to be called sculptures. Children get absorbed in their playing and then tire of it. When they find different play equipment pieces in the forest, however, they start running toward them. Isamu Noguchi seems to have accurately depicted this scene. A shallow pond from Isamu Noguchi’s planar form is installed in the middle of this gentle, cone-shaped site surrounded by promenades. This pond, which envisions beautiful seashore, is paved with coral. The water springs forth from three outlets in the pond and disappears on its own while making ripples. The delighted voices of children resonate here in summer. Similar to the Play Mountain and Glass Pyramid, the 62-meter tall Mt. 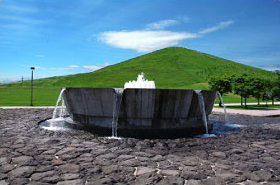 Moere constitutes a key form in the entire park as well as the only mountain landmark in the northeastern area of the city of Sapporo. Mt. 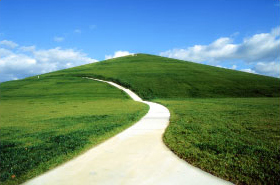 Moere can be climbed from three directions and five different routes. From its summit, you can overlook not only the entire Moerenuma Park, but the entire city of Sapporo. In winter, visitors can enjoy skiing and sledding on the mountain, making this mountain one of the main attractions for visiting the park in winter. Play Mountain, which measures 30 meters in height, creates the major form for the entire park. The idea that Isamu Noguchi envisioned in 1933 and contemplated about for a long period of time was brought to realization at this park. When you climb the pyramid or granite slope reminiscent of ancient ruins, you can enjoy the magnificent landscape in the comfortable breeze. 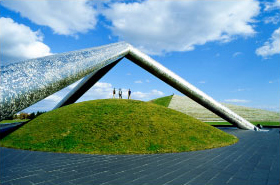 The Tetra mound is a simple, dynamic form that consists of a triangular pyramid (13meters in height), composed of stainless steel columns, two meters in diameter, and a grassy mound. The stainless steel surface that was completed to resemble Isamu Noguchi’s fountain works in Detroit shows different expressions with changes in lighting. The adjoining square is used for events and other purposes. Water springs forth from Aqua Plaza and slowly flows into the approximately 150 meter long canal. Streams are shallow, allowing visitor to dangle their feet and come in contact with water. Although it can be referred to as an extension of “California Scenario”. Isamu Noguchi’s garden piece, the water and stone square surrounded by two large mountains can also be viewed as the epitome of Sapporo. The entire area of this hemispheric structure is a stage approximately 15 meters in diameter, where performances, such as concerts and dancing, are held. Inside the building are anterooms for performers and restrooms. The symbolic shape was designed to direct focus on the landscape at the foot of Play Mountain. The Park belongs to everyone. Please treat it with respect. Help keep the park clean. Please take your trash with you when leaving. Please keep pets on a leash at all times. Please do not have your pet excrete on the lawn.Please clean up after your pet. Please follow signs and park staff’s instructions.